Happy second week of the year new everyone!! Hope your year has been off to a great start! 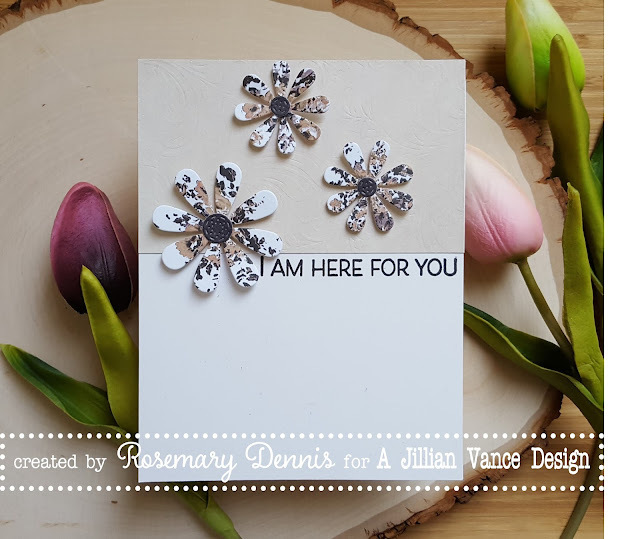 I'm stopping in today with a super simple "thinking of you" type card. But... before I get started have you seen all the fabulous new products in the AJVD store??? If not you need to get over there right away (after you check out my card, of course, lol!!) for a look in the new section of the store and do some shopping! You won't be sorry, lol!! Sadly, my card doesn't use any of the new goodies... mine are on there way to me and you will see some next week!! 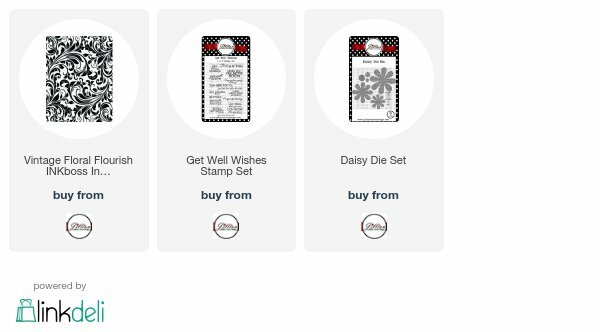 This card uses some oldies, but goodies: Daisy dies and Get Well Wishes. I have been trying to not purchase patterned paper, but I fell in love with the Prima Zella Teal paper collection and purchased a pad. I used several pieces from that pad to create my card. The top piece of paper was embossed with the INKboss Inkpression Vintage Floral Flourish plate, trimmed down and adhered. Love the soft embossed look it provides to the paper. The daisies were die cut from another piece of the paper creating this sort of ink-blot look to the flowers. Before adhering the flowers I laid the largest one down so I could get the right placement for my sentiment. Once the sentiment was stamped if adhered all the flowers and I was done. Like I said... super simple! Going to add this to the current Simon Says Stamp Wednesday challenge to use patterned paper. The absolute perfect paper to use for the daisies--just love it! Beautiful background with that new plate! Another fabulous card, Rosemary! Love the paper you chose for the flowers Rosemary! The neutral palette of this card is fabulous. PRETTY card Rosemary! Pretty trio of daisies, Rosemary, and I love what you did with the impression plate!! A great CAS design, Rosemary, made even prettier with the pp flowers! Thanks for playing along with us at the Simon Says Stamp Wednesday challenge!